If someone wants to buy a home and live in it for the next 20 years, then sure, go ahead and buy. Enjoy the low interest rates and live in your own place instead of renting. If you can survive a 10% to 15% price drop, and if you can survive a 2% interest hike, then there’s really no issue. If someone wants to buy a house or condo as an investment and rent it out with a negative cash flow while expecting the price to go up by 4% a year, good luck to you. 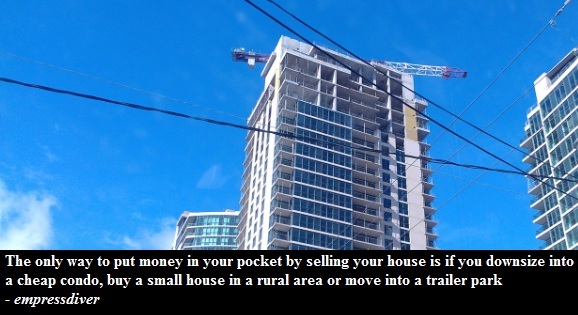 I agree that it is totally possible to time the real estate market and make money from it, depending when you buy. Heck if you bought in 2008 and sold now, that would be a lot of money that you’ve would made. However, right now it doesn’t seem like a good time to invest in condos. Overall, I am against prices going up! Period! The people who benefit from rising prices are real estate agents, banks, some lucky flippers and retirees who are downsizing and cashing in. Nobody else benefits. In fact, the majority of people do not benefit. When food goes up or gas goes up in price, everyone complains. Why should we treat real estate inflation as a good thing? The majority of people buy a home to live in it, not to invest. How on earth are the younger generations supposed to afford all this pricey real estate? This is simply not sustainable. Brad Lamb says that Toronto is becoming a world class city. It is getting Manhattanized. **ck that. Again, the majority of people are not going to benefit from that! Incomes in Toronto have risen by 8% adjusted for inflation between 2000 and 2010. Real estate prices have doubled. That doesn’t benefit Average Joe, the Torontonian. Yes, he might be able to afford a monthly payment on a tiny condo due to emergency interest rates, but one has to ask themselves: why does it take emergency interest rates to afford a place? How sustainable is that? It doesn’t really matter how much prices fall, what matters is that people need to start viewing rising housing costs for what they really are – inflation.